I love it when something great leads you into something equally good: just like “500 Days of Summer” got me to this amazing song, this delicious cake got me into trying – and liking – dates. Preheat the oven to 180°C/350°F. Butter a 26x16cm baking pan*, line with baking paper and butter the paper as well. Sift the flour, baking powder, salt and ginger into a large bowl and set aside. Place the dates, water and baking soda in a bowl, mix and allow to stand for 5 minutes. Transfer to a food processor, add the butter and sugar and process until well combined. Add the eggs, one at a time, and process well. Pour over the flour mixture and mix well with a wooden spoon. Pour batter into prepared pan and bake for 30-35 minutes or until risen and cooked when tested with a toothpick. Allow to cool in the pan, then carefully unmold. 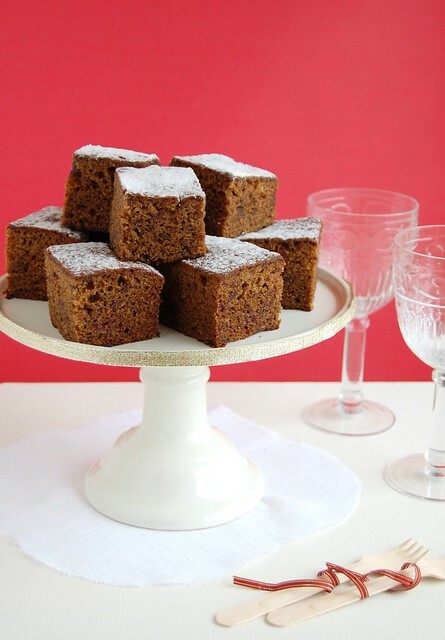 Cut into squares or diamond shapes and dust with icing sugar to serve. this looks gorgeous! i made my grandma's date cake yesterday and it is so addicting. another beautiful post, Patricia. I love visiting you! Perfect with a cup of tea! When I was a kid you couldn't pay me to eat ginger OR dates. So glad I got over that hump! I love dates - what an elegant cake! I am such a sucker for gingerbread cake! I love the idea of using brown sugar and dates. I think ginger and dates are good together. I too recently made a date cake but with honey and ginger ice cream. Dates are awesome! I've been wanting to try the hot water/blender method for baking with dates. This cake looks delicious and it's so perfect for the season! Aw I love Temper Trap, especially "Fader" and "Science of Fear." I've been seeing some tempting date recipes lately, but have yet to try them. This looks great! Hey, Sophia - this is great news! Thank YOU for letting me know how the recipe turned out for you!